Washington, D.C. – October 20, 2014 – The 2014 Washington International Horse Show (WIHS) kicks off tomorrow with six days of action-packed equestrian sport and entertainment at Verizon Center in downtown Washington, D.C. For one week each year, our nation’s capital welcomes top horses and riders from around the world to compete at the country’s most prestigious metropolitan indoor horse show. Now in its 56th year and recently designated a prestigious Heritage Competition by the U.S. Equestrian Federation, WIHS is one of the most historic and well-known equestrian events in the world with a significant record of hosting Olympians, national champions, the finest hunters, our country’s most talented young equitation riders, and top ranking junior, amateur and pony competitors. This one-of-a-kind D.C. tradition offers top equestrian sport, family-friendly community events, including Kid’s Day and Barn Night, fabulous shopping and hospitality packages for ringside dining. The top show jumping competition of the week is the $125,000 President’s Cup Grand Prix presented by Events DC, a top-rated CSI 4*-W World Cup qualifying event on Saturday night. U.S. Olympic gold medalists McLain Ward and Beezie Madden will be among the world-class riders from five countries: Belgium, Ireland, Colombia, Brazil and the U.S., jumping for the biggest purse of the week. The winning presentation for last year’s President’s Cup Grand Prix, presented by Events DC. Photo copyright Shawn McMillen Photography. Events DC leverages the beauty, history and diversity of the most powerful city in the world to attract and promote an extensive variety of events, resulting in amazing experiences for residents and visitors alike, and generating economic and community benefits for the city. Held on Friday evening, Military Night, presented by The Boeing Company, is one of the most exciting and breathtaking events of the week. The Boeing Company $25,000 Puissance high jump competition is a fan favorite as spectators watch horses and riders take on the great wall in an extraordinary display of power and courage. The current North American record of 7’ 7-1/2” was set at WIHS in 1983. WIHS has enjoyed a close relationship with the United States military since the earliest days of the horse show when former U.S. Army horses and riders represented the country in national and international competition. That connection continues today through the WIHS Armed Forces Program that includes Military Night and the popular Military Ticket Program, presented by Fidelity Investments®. Thanks to program supporters The Boeing Company, The Travelers Companies, Inc., Waldron Wealth Management, Helen K. Groves and Jacqueline B. Mars, thousands of military families receive complimentary tickets to enjoy this year’s show. WIHS is honored to welcome Tragedy Assistance Program for Survivors (TAPS) as the Official WIHS Military Charity Partner for the fifth year. TAPS, a 24/7 tragedy assistance resource, is dedicated to caring for families of the fallen through immediate and long-term emotional help, hope, and healing. TAPS is at the center of an exciting new feature of the $50,000 International Jumper Speed Final – the “Jump for TAPS” Challenge presented by T. Boone Pickens to benefit TAPS. Each time a rider clears the TAPS jump, Pickens will donate $1,000 to TAPS, and if all the riders clear the TAPS jump, he will make an additional $5,000 donation. Junior riders compete all year to earn an invitation to compete at the WIHS Equitation Finals with the top 40 juniors in the country, 30 from the East Coast and 10 from the West Coast, going forward for the title. The WIHS Equitation Finals, a three-phase competition held on Fridayand Saturday, is one of the most prestigious year-end events for junior riders. Famous past winners include two-time Olympic gold medalist McLain Ward, Kent Farrington, now the #4 ranked show jumper in the world, and Brianne Goutal, winner of the 2013 American Gold Cup. Thursday’s Barn Night presented by Dover Saddlery is a favorite WIHS tradition for local young riders and horse enthusiasts who attend in groups to enjoy a fun, horse-filled evening, which includes the $20,000 International Jumper Gambler’s Choice Costume Class sponsored by Equestrian Sport Productions, contests, prizes, and an autograph session with top riders. New this year, special bonuses will be given to top-scoring riders in addition to their other awards. The Leading International Jumper Rider will receive $15,000, sponsored by The Boeing Company; the Leading International Rider Under 25 will receive $10,000, sponsored by Sleepy P Ranch; and the Leading Hunter Rider will receive $5,000. The Young Jumper Championship Incentive Bonus Program, sponsored by SHF Enterprises, returns this year with $20,000 in play to encourage investment in developing young horses. When not competing, riders and trainers will be able to relax and enjoy the hospitality of The Sterling Club Exhibitors Lounge sponsored by Marshall & Sterling. Kids’ Day, held on Saturday, October 26, is a free, fun, family-friendly event created to engage the local community and educate kids and their families about horses and equestrian sport. It will take place from 10 a.m. to 2 p.m. both inside Verizon Center and on a closed city street just outside the arena. Sponsored in part by the EQUUS Foundation, this popular community event brings new fans to WIHS and equestrian sport each year. Outdoors, kids will enjoy a Horseless Horse Show sponsored by Animal Planet, a grooming station provided by Meadowbrook Stables, pony rides, a mini pony kissing booth, and a chance to meet Klinger, the famous U.S. Army Caisson Platoon Horse. 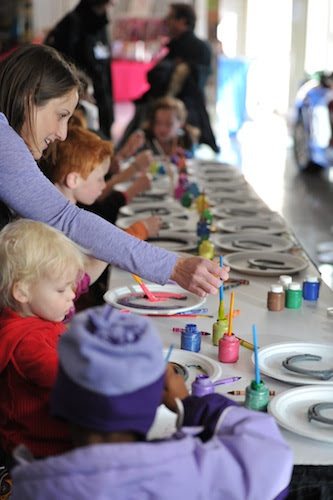 Indoor activities, held on the Verizon Center concourse, include face painting and temporary tattoos, horse shoe painting, sweet treats from Georgetown Cupcake (limited to first 100 children under 12), a prize drawing from Breyer Animal Creations and a Paisley Pony magazine. There are a variety of activities at Kids Day. Photo copyright Alden Corrigan. Many exciting exhibitions are highlighted throughout the week. Held on Thursday and Saturday nights, the wildly popular WIHS Shetland Pony Steeplechase Championship Series presented by Charles Owen is non-stop fun. The pony races have all the trappings of professional races, riders in colorful silks, a bugler, race caller and even a photo finish, but in miniature. The jockeys are youngsters from seven to 14, mounted on traditional fluffy Shetland Ponies racing over a course of tiny hurdles. Also on Saturday night, WIHS will host a majestic appearance by The Wong People Chinese Lion Dance to celebrate the Chinese Year of the Horse. They are highly acclaimed for their skill in bringing to life the centuries old legend in an artful, educational and entertaining exhibition. On Friday night, cowgirls and celebrity riders will team up to ride in the first-ever Army vs. Navy Celebrity Barrel Racing exhibition, presented by Washington Area Chevy Dealers, and the U.S. Army Old Guard Fife and Drum Corps will perform with musicians wearing uniforms reminiscent of those worn by General George Washington’s Continental Army in 1784. Three special events in held in the Acela Club offer great ways to celebrate at WIHS and enjoy the show. The Buck Breast Cancer reception on Thursday, Oct. 23 will benefit the Capital Breast Care Center. Friday night’s Armed Forces Reception will benefit therapeutic riding centers offering programs for the military community. The President’s Cup Party, presented by Washington Life magazine, will celebrate the Chinese New Year of the Horse. For tickets, visit www.wihs.org/social-events. Tickets are available online at Ticketmaster.com or by calling 1-800-745-3000. For discounted tickets through Group Sales, call 202-661-5061. Tickets also may be purchased in person at the Verizon Center Box Office. For information about Verizon Center accessible seating and services, call 202-661-5061 or 202-661-5065 (TTY). Full ticket information can be found at www.wihs.org/tickets/. The WIHS live stream, sponsored in part by Nutro, will offer total coverage of all the show’s competitions and exhibitions. The WIHS live stream is available at www.wihs.org. 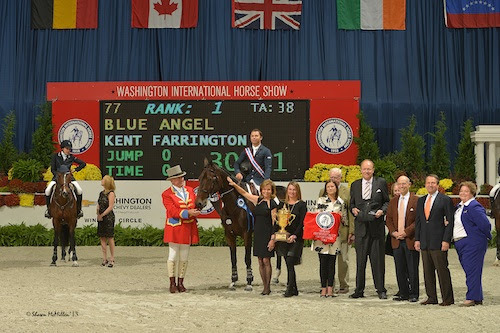 Established in 1958, the Washington International Horse Show attracts more than 26,000 spectators to the six-day show, which includes Olympic-level competition along with community and charity events. More than 500 top horses and riders come to D.C. from all over the globe to jump for more than a half a million dollars in prize money. In 2014, the Fédération Equestre Internationale (FEI), the international governing body for all Olympic equestrian disciplines,raised the show’s rating to CSI4*-W to reflect the increase in prize money for international show jumping. Event highlights include the Puissance high jump competition on Military Night (Friday), the $125,000 President’s Cup Grand Prix, a World Cup qualifier (Saturday night) and Kids’ Day (Saturday), a free, fun and educational community event. The Washington International Horse Show Association, Ltd. is a 501(c)(3) nonprofit charitable organization headquartered in Washington, D.C. WIHS is an official USEF Heritage Competition and is recognized as a Top 25 Horse Show by the North American Riders Group.